Paul Roessler - Keyboards on "Drug Me" and "Stealing People's Mail"
6025 - Other guitar on "Ill In The Head"
Ninotchka - Keyboard on "Drug Me"
Claderwood, Geoffrey Lyall, Eric Boucher, Ninotchka, Barbara Hellbent, HyJean, Curt and Chi Chi) for the clubhouse scene in "Chemical Warfare." 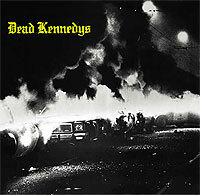 All songs written by Dead Kennedys except “California Über Alles” by Dead Kennedys and John Greenway and “Viva Las Vegas” by Pomus/Schuman, Carlin Music Corp. Lyrics by Jello Biafra except “Your Emotions” by East Bay Ray, “Forward To Death” and “Ill In The Head” by 6025.